CrystalTek™ - Vinyl-Off Environmentally Safe Vinyl and Adhesive Remover. This is a BREAK THROUGH product in the Vinyl and Adhesive Removal Field. 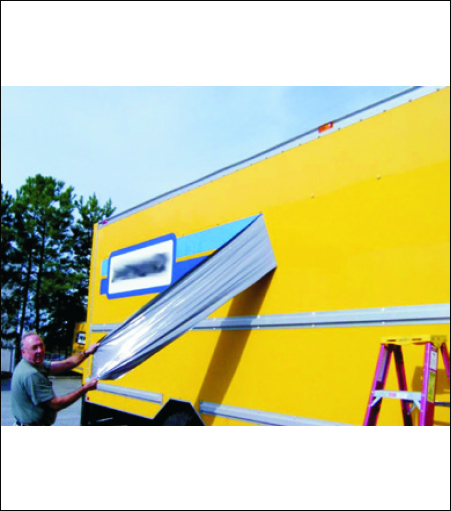 We designed VINYL-OFF to remove vinyl graphics from fleet trucks, glass, signage, etc. Just wipe it on, wait a few minutes, and peel off the vinyl, and the adhesive, in one step! Take up to 90% less time. You'll save HOURS of labor! And a surprise bonus...it's about as safe as bath soap! We only make products that are environmentally safe and biodegradable. VINYL OFF is also non-flammable and water soluble. We can even ship it via air. It's that safe. One Gallon typically covers approximately 1500 square feet of vinyl. We have one experienced user who claims to get over 3000 square feet of coverage per gallon!